We are providing an exclusive range of Self Adhesive Colored Tape for packaging purposes in various industries. Made using superior grade kraft paper, the offered tape is broadly used and appreciated by our valuable clients. Offered tape is quality tested on various parameters to ensure its flawlessness. We offer this paper tape in various specifications and can also be customized as per the individual needs of clients. 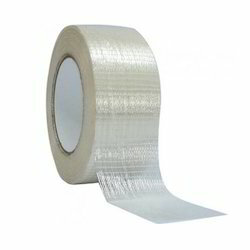 We are providing different sorts of Duct Tape, which have long lasting adhesive and resistance to weathering. These are preferred in situations where strong, flexible, tacky tapes are needed and are used widely across various industries in addition to home repair and improvement, construction and industrial applications. These duct tapes are available in different designs, colors, nominal rates and are largely used for clothing and fashion accessories. 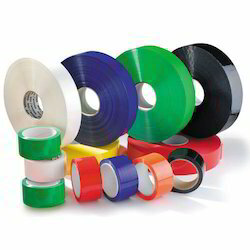 We are the prominent manufacturer and supplier of a high quality assortment of Double Sided Polyester Tape. 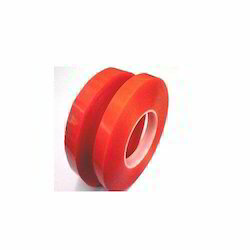 Offered sided polyester tape is crafted using supreme class raw material with the help of latest technology in compliance with set quality standards. Widely used in various industries for packaging purposes, this polyester tape is available in various specifications as per the requirements of clients at highly competitive prices.